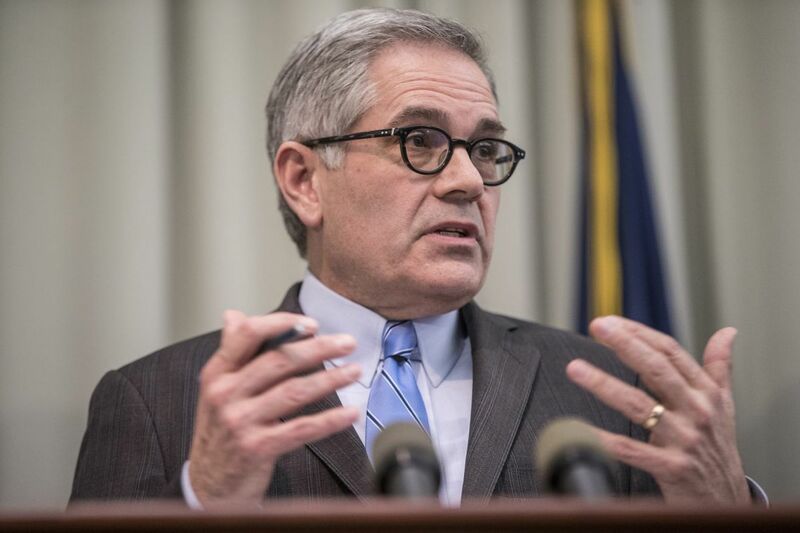 Philadelphia District Attorney Larry Krasner speaks at a news conference. Officer Robert Esack twice rammed his knee into someone's face in 2016, shattering facial bones. Officer Angel Ortiz mishandled evidence in a 2011 narcotics investigation and falsified police reports. Both last year were deemed guilty of misconduct by a police disciplinary board and suspended for five days. And both were subsequently placed on a list of officers the District Attorney's Office considered too untrustworthy or problematic to call as witnesses in future criminal cases. The list, acquired this week by the Inquirer and Daily News, detailed their alleged transgressions and discipline. Esack and Ortiz remain on the police force. They are part of a dubious group: officers disciplined by the Police Department and essentially neutered by prosecutors, yet still on the job and collecting a taxpayer-funded salary. In total, nine of the 29 officers placed on the DA's "Do Not Call" list made public this week are still on active duty. Last year, the nine were paid more than $740,000. That expense and futility is the price paid, critics say, for a police disciplinary system that all too often makes it difficult to punish problem officers — and even harder to fire them. And that same system provided prosecutors the list of questionable police officers considered too tainted to count on in court. The list was developed by former District Attorney Seth Williams and released this week under court order by new top prosecutor Larry Krasner. For decades, Philadelphia police commissioners have joined independent analysts in complaining that union rules had stripped them of the power to effectively discipline bad cops. Former Police Commissioner John F. Timoney, who ran the department from 1998 to 2002, called the city system a "joke." "In New York, if the commissioner fires you, you're done. You never get [your job] back," said Timoney, once second-in-command of the New York City force. "In Philly, it's like a game. Everyone understands it." Said former Commissioner Charles H. Ramsey: "It's very hard to maintain discipline in a police department especially when at every turn you have cases that wind up getting overturned, people brought back, and in many cases for some very, very serious allegations." Alan Yatvin, a Philadelphia lawyer expert in challenging police misconduct in civil cases, said police commanders often find their hands tied in disciplinary matters, unable to even transfer officers in some instances. "The collective bargaining agreement with the Police Department is very skewed in favor of the police officer," he said. "It's very hard to fire a cop." The Fraternal Order of Police, the union for the department's 6,300 officers, and others reject those criticisms. "The arbitration process as it applies to the discipline of police officers is a common punching bag for outsiders who are not familiar with the process," said Marc L. Gelman, a lawyer hired by the FOP to represent officers. "Nevertheless, it is, without question, the fairest, most effective and efficient means of resolving labor disputes between the FOP and the City." Still, in a succession of critiques over the years, independent analysts have found serious fault with every facet of the police disciplinary system. In a scathing 2003 review, Ellen Ceisler, now a state appellate judge but then the department's internal integrity officer, wrote: "There are simply too many ways to manipulate the system and too little accountability at each step of this inscrutable process to generate confidence in the integrity of the system." In 2015, the U.S. Department of Justice studied Philadelphia's response to use-of-force incidents and again called out a lack of consistency, noting that two different internal review boards often gave conflicting determinations. In a follow-up report the next year, the Justice Department blamed the city police labor contract for blocking reform. In a recent article, the website City & State PA reported that Internal Affairs investigators found evidence of wrongdoing in only 15 percent of 8,555 civilian complaints filed against officers in the last five years. In the time-consuming and complex disciplinary process, a finding of wrongdoing by Internal Affairs may be only the first step in a long road. After that, a case is reviewed by the Police Board of Inquiry. And after that, an officer can seek yet another review by an arbitrator. Much about the disciplinary process is cloaked in secrecy. The department posted citizen complaints against police online last year. Yet at the same time, the department removed critical information that had previously been available, including the names of the officers, witnesses, and people who brought the complaints. And the online information only includes complaints brought by citizens. City officials have never made public the accusations of misconduct against officers brought by the department itself. All of these issues came into high relief after the 2015 acquittal of six narcotics officers on federal corruption charges, including allegations they had framed suspects. Ramsey fired the officers before trial, saying their conduct represented "one of the worst cases of corruption I have ever heard." Two months after their acquittal, an arbitrator ordered the officers back on the force and awarded them $90,000 in back pay. The ruling in the case was made public, but only after most of its reasoning was redacted. After returning to work, the officers were put back on street duty, although they were not returned to the narcotics squad. Despite their acquittals, the officers found their past made it difficult for prosecutors to use them as witnesses in criminal cases. In some instances when the officers made arrests, the District Attorney's Office quietly dismissed the cases. In others, prosecutors found a way to go forward, using other officers involved in an arrest as witnesses. One of the six, Sgt. Michael Spicer, landed on the "Do Not Call" list of 29 officers. Though not on the narcotics unit, he continued to make drug arrests, which, a source said, were in some cases viewed as problematic. In all, the nine active-duty police on the "Do Not Call" roster made 41 arrests last year. Esack led the group with 14 arrests. Ortiz was second with 13. Ortiz made more than 30 arrests between 2012 and 2017 for offenses including possession of marijuana, drunken driving, and aggravated assault, according to court records. Even after he was disciplined by the department in March 2017 over the paperwork associated with a drug bust, he continued making arrests, the records show. He could not be reached for comment for this story. His misconduct stemmed from a suspicious drug bust in 2011, which netted thousands of dollars' worth of heroin. Ortiz's partner later accused him of filing paperwork filled with falsehoods to justify the arrest. In March 2017, the Police Board of Inquiry found Ortiz guilty of making false entries in a police report and failing to follow procedures for handling narcotics, according to the district attorney's list. Esack, meanwhile, was found guilty by the inquiry board in July of conduct unbecoming an officer for using excessive force and striking a person twice with his knee, according to the DA's list. He could not be reached for comment. Esack, too, continued racking up arrests after he was suspended. Within a month, he arrested Jae Un Lee for counts including simple assault, though charges were eventually dropped when the complaining witness failed to appear. Esack has made four additional arrests since then — including last month, when he arrested Patricia Bradley for aggravated assault and related counts. Bradley is to face a preliminary hearing next week — a hearing that apparently may not include testimony from the man who arrested her. Staff writers Mark Fazlollah, Dylan Purcell, and Michele Tranquilli contributed to this article.